A sinfully chocolaty muffin for a quick bite not just in morning but any time of the day. I love chocolate or anything that has chocolate in it. One of my favorite comfort foods is a chocolate chocolate-chip muffin with a glass of hot milk. It’s one of my favorite midnight desserts too! 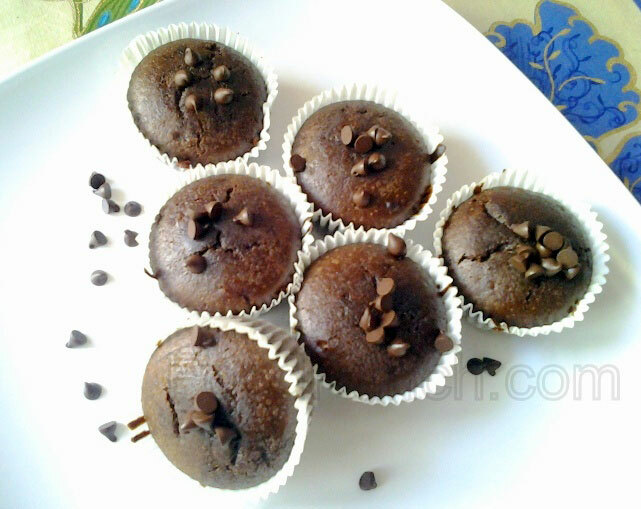 Let me share my favorite recipe for chocolate choco-chip muffins. It’s easy, fuss free and super delicious! Before you begin, set your oven at 180 degrees centigrade for pre heating. Line the muffin moulds with some muffin papers and keep aside. Now sieve all the dry ingredients together and keep aside. The dry ingredients would be flour, cocoa powder, cooking soda, baking powder, sugar and chocolate chips. It’s important for the chips to sit in the dry mixture for some time. This is so that they are well coated with the dried mixture and remain light. Usually, chocolate morsels sink in the bottom while baking. This trick would keep them from sinking. Make sure you save a few morsels for the final sprinkling. Gather all the liquid ingredients like milk, oil, egg and vanilla extract together and whip well. Now mix the dried mix into the liquid in equal installments, so as to prevent the formation of lumps. The batter will look more liquid, but you will have no complaints when you see the well risen, springy muffins. The batter should be immediately spooned into the muffin cups. 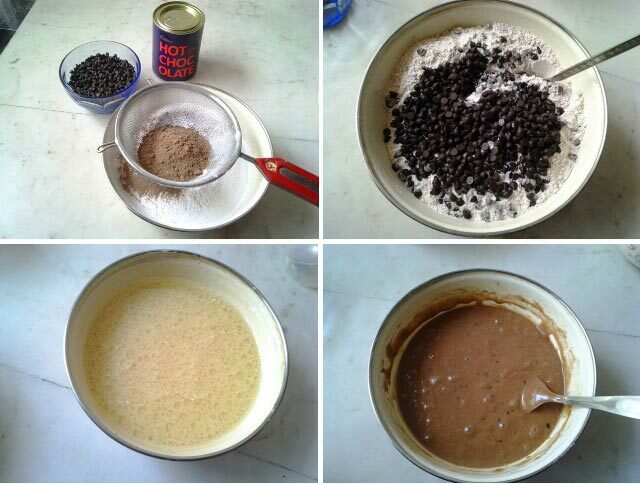 Throw in the saved chocolate chips over the top and immediately place in the oven, to bake. Almost 24 muffins can be baked out of this batter. Each batch of 12 muffins will take 20 minutes to bake. Allow them to cool and then enjoy a dark, moist, springy muffin either alone or with your morning cuppa! Malavika, such a beautifully defined Recipe. I for sure want to try baking after reading this post. 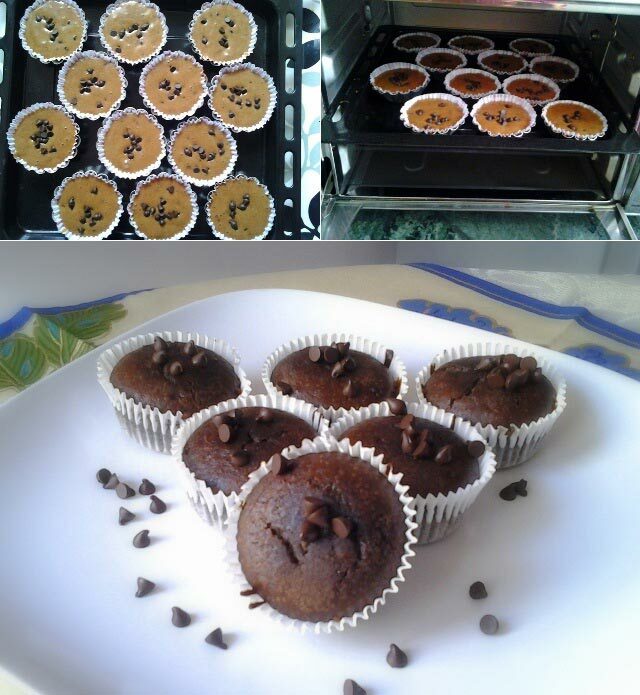 Hi welcome to foodpunch Megha :)… You must indeed try baking, its fun and addictive too ..